The Vent-Axia Lo-Carbon Minivent ducted bath/shower kit includes all the components necessary to install a ducted 100mm system. This simplifies fitting of an efficient ventilation system to small rooms including bathrooms, shower rooms and toilets. It is especially suitable for en-suite bathrooms. When installed, the fan kit has ample performance to meet the Building Regulations requirements for toilets and bathrooms. The timer version should be used for internal rooms. 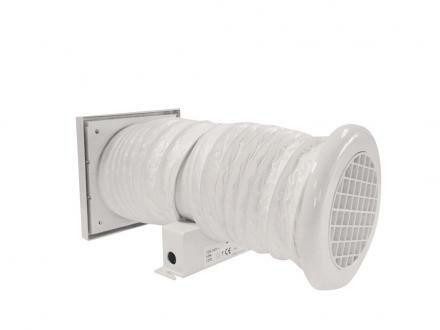 The kit consists of a Lo-Carbon Minivent In-Line fan, a white ceiling grille and spigot, 3 metres of flexible duct and an external louvre for soffit or wall mounting. 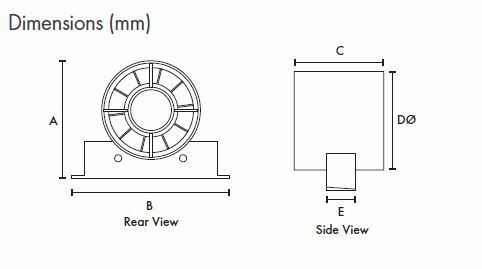 The duct should be cut to the required length and the bend radius kept to a maximum to provide optimum fan performance. Enclosed terminal compartment, Class 2 appliance. Supply voltage 220-240/1/50Hz. Comprises - high output tube fan, 3 metres of flexible duct, ceiling inlet grille and spigot, soffit/ wall outlet grille. Suitable for fitting to doors and panels to allow better internal air circulation and replacement. Consists of a two-piece telescopic set, which fits unobtrusively on either side of the door panel. Minimum fixing thickness 30mm. Plastic. Dimensions: 454 x 90mm.